Played Out is a weekly reflection by Richard Clark about his time with mobile games, and the moments they intersect with life. The bird in Tiny Wings doesn’t have a name, but you give him one. I called him Richie, which is what my name would be if I were eternally a nine year old. It wouldn’t. If you remember being nine, you probably remember doing a lot of esoteric activities to keep yourself entertained. If you’re like me, a lot of that stuff was pointless diversion in the guise of some unobtainable future goal. I remember spending months practicing with my ‘lip sync band’. In my bleeding heart phase I went door to door collecting money to “save the whales”. A friend and I spent a significant amount of time attempting to build a robot; cobbling a bunch of mechanized pieces together. For some fugitive reason, we believed it would work. There was a lot of trial and even more error. We were totally and stupidly convinced that at the end of all of it we would have a robot to serve us breakfast every morning. Richie the bird also has a dream and his plan is just as misguided. His dream is to fly in spite of his misshapen wings. In order to accomplish this, he’s going to swoop down as many hills as possible. At first, he thinks he’ll just jump. Eventually he’ll get enough momentum to fly. Just like all of the “normal” birds. 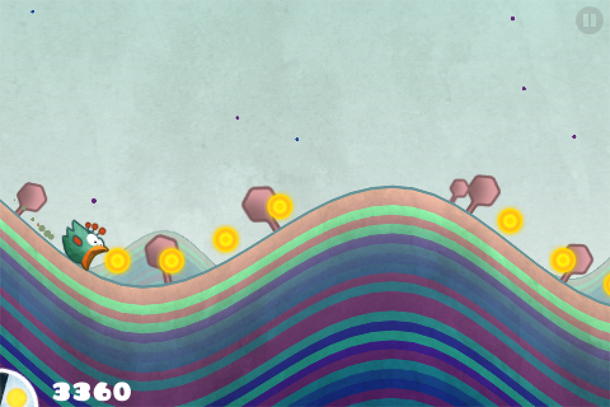 Tiny Wings requires a single tap to control the bird’s pseudo-flight across dozens of hills and islands. Pressing down on the screen causes the bird to embrace gravity for just long enough to swoop down into the valley between hills, only to coast up the next hill and into the air. For a few moments, he experiences an exhilarating weightlessness. He feels a momentary success. He begins to fall again. If he’s lucky, he falls at just the right spot where he can maintain momentum and shoot up the next hill. Otherwise, his momentum stops cold, and he’s forced to start over. There’s always a point at which this poor bird’s momentum stops. The bird always fails. In fact, he fails every time he hits the ground, which is a lot. The question isn’t whether or not this tiny-winged bird succeeds at flying; the question is how gracefully he fails. I turned 30 this past week, and as a result I thought a lot about what turning 30 means. Or should mean. I have a few friends who turn 30 at around the same time. None of us are really struggling with feeling “old” (I suspect that comes at 40). Instead, we struggle with feeling unaccomplished. We thought we’d be further along in our careers, or we thought we’d have a different career by now, or we thought we’d have kids, or more kids, or have a house, or a degree we could use. This is a very real anxiety amongst people my age: we’ve all tried really hard. We’ve all spent our lives going to school or preparing for what we were sure we were destined for. And we tried so, so hard to make it happen. But there are moments when we feel the gravity pulling us down, and we’ve learned not to fight it. We’ve learned to go with the gravity, to land at just the right spot. To fail gracefully. While poor Richie is busy learning how to fail, the systems surrounding Tiny Wings make demands, telling him that if he can’t at least succeed he should try to reach the 7th island, or spend 34 seconds in “fever mode” (a mode activated by achieving perfect swoops between hills), or achieve 7 perfect swoops on the first island. These goals might be arbitrary, but they are demanded of him nonetheless. It’s a to-do list that makes sense of the failure – it gives it immediate and quantifiable meaning. If you can’t fly, the least you can do is these things. For him it’s all swoops and islands and fever mode. For us it’s paying off student loans, submitting resumes, and networking. They are means to an end, and in list form they are cynical and joyless endeavors. The player cares deeply about these things, often to the detriment of the bird’s desire to fly as far as possible. They grind away until they are completed, restarting if they fail. Distance, flight, joy and love no longer matter – checking off the list does. But Richie the bird is blissfully unaware of these expectations. He just wants to fly. Not because it will pay his bills or improve his reputation, but because he loves that feeling of soaring higher into the sky, outracing the sun, the wind blowing across his face. “Whooo hooooooo!” he shouts, just before he finds himself falling again. He sees that failure as an opportunity to try again, and man, does he go for it. Sometimes he lands directly onto the broadside of an oncoming hill and screeches to a halt. Still, he climbs, because he knows another opportunity is coming, and it’s gonna be fun. But Richie is a young bird, almost certainly less than nine bird years old.